Dr. W. Ryan Butler joined us in 2008. 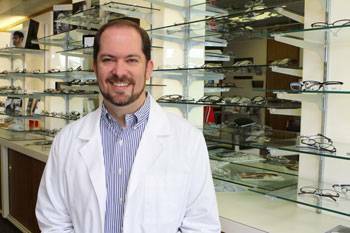 He brings with him more than 20 years of experience in many different areas of optometry. In addition to his ability to treat eye diseases such as infections, abrasions, and glaucoma, Dr. Butler specializes in pediatric eye care (ages 12 and younger). Dr. Butler also brings to this office a vast knowledge of laser vision correction, having handled several thousand patients through their pre-operative and post-operative needs with LASIK, PRK, and refractive lens implants. In 2012 Dr. Butler earned his board certification from the American Board of Optometry. This highly prestigious honor is currently held by less than 10% of all optometrists, and only a small number of doctors in the Texas hill country can claim this accomplishment. Additionally, Dr. Butler has been appointed for his services for medical and advisory positions by numerous governmental bureaus, including the Texas Department of State Health Services, the Texas Optometry Board, and the United States Department of Justice. He is a member of the American Optometric Association, Texas Optometric Association, and the Central Texas Optometric Society. Dr. Butler received his doctorate degree from the University of Houston. During his internship he was chosen by his peers to perform the pre-flight eye examination for Senator John Glenn before making his historic space shuttle flight on STS-95. As a student he was very active delivering optometric care to the surrounding community. He also served in student government and was committee chair for hosting new students visiting the school's campus. Before attaining his doctorate Dr. Butler obtained his bachelor degree from Texas Tech University in Lubbock. As a student he was a 4 year member of Texas Tech's marching band, the Goin' Band from Raiderland. He was also an active member of Kappa Kappa Psi, the honorary marching band fraternity, and is presently a life member. In addition to serving as a resident assistant in the dormitories, he performed undergraduate research in the biology department and routinely earned placement on the Dean's List and membership in 4 honorary organizations for academic achievement. In his free time Dr. Butler enjoys the company of his wife (and high school sweetheart) and two children, bike riding, geocaching, keeping in touch with old friends, photography, and serving in ministry of his church. He has served in Awana (a world-wide children’s ministry), and plays the trombone and tuba in his church’s orchestra, and has played in a small ensemble for nursing home residents.